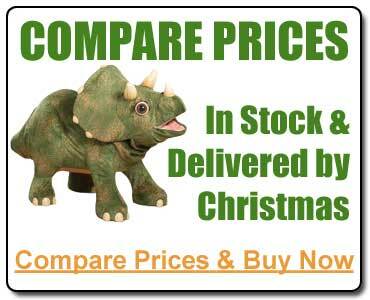 Kota the Triceratops toy is a ride-on dinosaur that is about as close as you'll get to a real pet dinosaur. Kota the Triceratops is more than 3 feet long and 2 1/2 feet tall with a realistic scaly look in a soft furry fabric, lifelike movements, and lots of personality. Kota triceratops is an animatronic dinosaur that roars, laughs, eats a leafy snack, and sniffs your hand. Children up to 60 pounds can sit on the triceratops toy's back and hold on for a roaring, bouncing ride set to adventurous music. You may have seen an animatronic dinosaur toy before, but you haven't seen one like Kota the Triceratops. Kota Triceratops is an interactive toy that will respond to your child's actions. Touch his horn, and Kota the Triceratops will sniff your hand. Tickle his belly, and he wiggles and makes happy noises. Put the included leaves in Kota's mouth, and he chomps and chews realistically. If you roar at Kota, he roars right back at you!